-Matched the shapes up with the pictures on this printable 3D shapes chart from here. I wasn’t sure how he’d do, but he did really well. He had trouble distinguishing the cube from the cuboid, and the triangle- vs. square-based pyramids, but otherwise he was able to match them up. 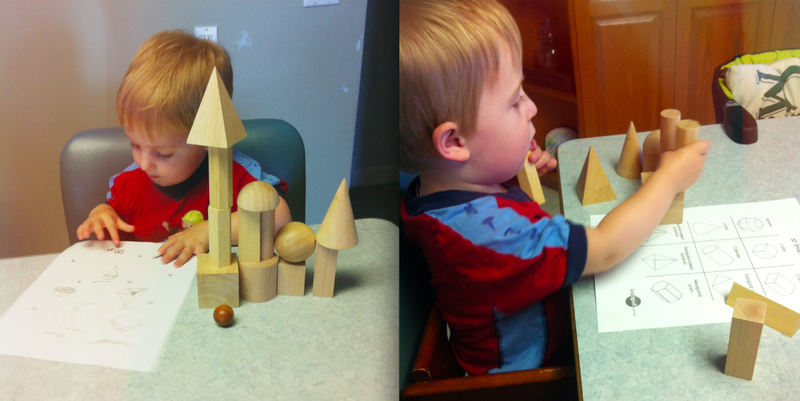 -Building towers and talking about flat and curved sides (mostly due to frustration with the spheres rolling away!) and how the prisms had different shapes as their sides. -Drawing some objects that looked like the solids on the back of the sheet: tent, ice-cream cone, half an orange. Also drawing stars and beds for our families, you know how it is. He’s only two.